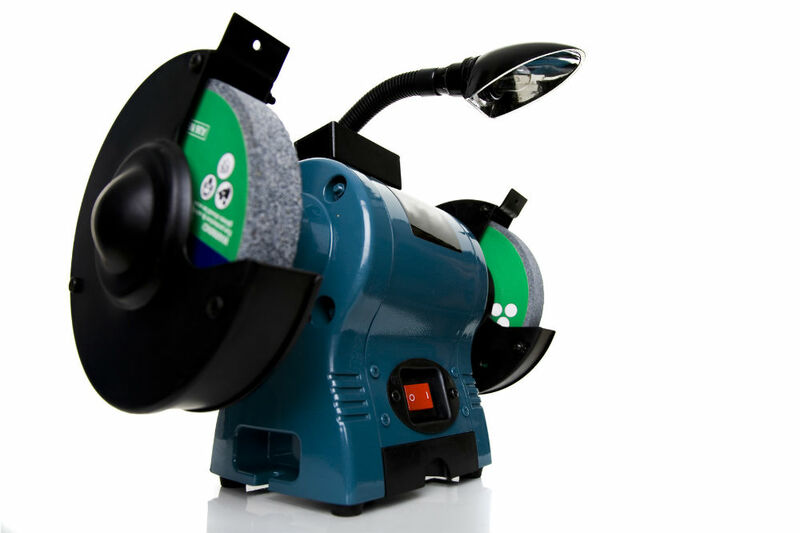 When you’re a newbie DIY hobbyist and you ask around among vets about how to buy a bench grinder, one of the general rules that may mention is that you really shouldn’t go for less than a hundred bucks. That’s because those cheap products, as a rule, tend to offer cheap quality as well. But there are exceptions to each rule, and that’s the case with the WEN 4276 6-Inch Bench Grinder. It’s literally exceptional. One of the reasons for the low price of the 4276 is that it’s very lightweight and compact. It only weighs 16 pounds. That’s heavy enough to stay in place, while it’s still light enough that you can bring it to a friend’s house without too much trouble. It’s also portable because it’s just small. It only comes in at 14 inches in length, 9.8 inches in width, and 15 inches in height. It doesn’t take up much room in your workshop and in storage. This comes with a 2.1-amp motor, with a single regular output of 3450 RPM without load. That’s a good enough speed to remove rust from metal and for deburring rough edges. It’s still low enough in power that it’s not all that noisy either. The startup is quick and easy as well, so you don’t start the work with frustration. Preinstalled wheels. It comes with two wheels, both of which measure 6 inches in diameter with a width of ¾ of an inch. One is 36-grit, so you can quickly smoothen out the rough parts and remove unwanted material, while the other is 60-grit, which works for most grinding tasks. Eye guards. There are clear eye guards in place so that you can see your work while the flying sparks and materials are kept from hitting your face and your eyes. While it’s still a good idea to don safety goggles, at least with this the risk of eye injury is much lower. These eye guards are also easy to remove, in case you want to replace a wheel with another for buffing your metal pieces. Work light. While you may have adequate lighting in your workshop, it doesn’t hurt when you have good light from up close illuminating your project. This comes with an attached overhead lamp that you can adjust to provide the best light. This should help you work more accurately. Cast iron base. Just because it’s lightweight doesn’t mean it’s unsteady. The solid base minimizes the wobbling that may result with the fast-spinning wheel, and it also enables safe mounting. Tool rest. Right by the wheel you have a stand which can support your bits and blades when you’re sharpening them. It’s adjustable, so you can set it in the way you want to best support your tools. It’s a solid piece of work with a single speed, so not much can go wrong with it. It’s durable enough that WEN offers a warranty of two years, and they’ve got a national network for their customer support. Basically, this is so affordable that you can easily get your money’s worth right away. How much will you have to pay to have a pro sharpen your lawn mower blades? The price for that service may actually be higher than the cost of this unit. The motor isn’t noisy, and it starts up at once. This is good as-is for sharpening your various cutting tools at home. You can buy accessories for it, like a wheel for buffing, to expand its usefulness. It’s easy enough to bring anywhere. The eye guards are easy to remove, so that you can change wheels with no trouble. The work light really lets you see your work better. It’s durable and the warranty is for two years. Send an email to their customer support, and you get a reply very quickly. You save a lot of money with its low price and value for money. It basically pays for itself with the first few times you use it. From the price alone you should realize that this isn’t an industrial-grade grinding machine. It’s just for a hobbyist with simple grinding tasks in mind. It doesn’t have the greater power and the variable speeds for more complicated projects. Just don’t put too much weight on your material against the wheel, or else it will slow down. The light won’t turn on until you’ve got the wheels spinning. It would be nice to see what you’re doing before you get the wheels to spin. 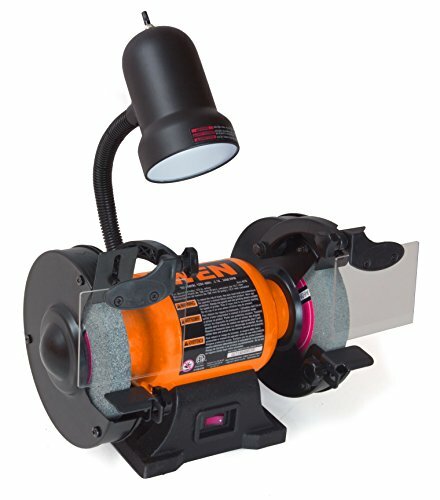 The WEN 4276 6-Inch Bench Grinder is a lightweight bench grinder that’s just about ideal for light tasks. Get the optional stand for it, and you’re ready to sharpen your various cutting tools. It’s easy to use, and you get your money’s worth right away.